Baseball players need to train for speed and first step. 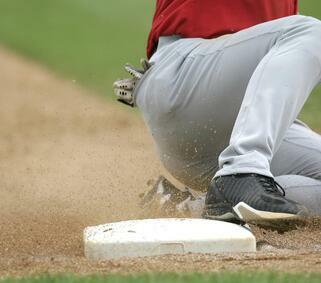 This can be the difference between making a catch, stealing a base, and scoring a run. The error most players make in the off-season is spending time in the batting cage and under a barbell, but never running at full speed. They actually get slower in the off-season. Speed training should be addressed every 3 days to and at maximum effort in order to get faster. An example of proper speed training would be max effort timed 20-40yd sprints for 6-10 reps with at least 1 minute between reps. Once they get used to this training and improve their time and mechanics they can work in different starting stances, like a steal break or a drop step to track a fly ball.